They went in as seven undergraduate students from Wilfrid Laurier University’s Health Sciences program, feeling a bit lost at a huge conference of family doctors from across Canada and around the world. They left with two awards from the Besrour Global Health Forum, part of the Family Medicine Forum, despite being the youngest attendees. 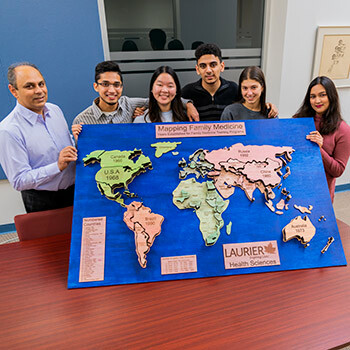 The group, consisting of Farhana Afreen, Isabella Aversa, Althaf Azward, Carlos Khalil, Jenna Lazarou, Calandra Li and Elvira Sathurni, won the delegates’ favourite award and was runner-up for the best poster award. The achievement was all the more remarkable because the former award resulted from a popular vote while the latter was judged. The group of upper-year students is participating in a research-based directed studies course under the leadership of Neil Arya, a family doctor and the Faculty of Science’s scholar in residence. Over the course of multiple terms, Arya is leading students in investigating the impact of family medicine models internationally. “We automatically assume family medicine is good but we haven’t had a study that looks at the impact of family medicine postgraduate training on health systems performance,” says Sathurni, a fourth-year Health Sciences student. Sathurni, who created and presented the award-winning poster, found the project interesting in part because she has personal experience of health care systems in multiple countries. She was born in India, raised in Dubai and came to Canada for university. The Canadian model of continuous care from one doctor is different from what she knows of the UAE and Indian models, she says. The first phase of the project focused on exploring what family medicine means around the world. Although they all worked together, each of the seven students spearheaded one aspect of the project, such as the literature review or the research ethics review. Li headed the creation of a map showing when family medicine was established in each country for which they could obtain data. Li, a third-year Health Sciences student, chose to make the map three-dimensional. She worked at the Science Maker Lab, under the mentorship of coordinator Ron Daniels, using software to design it and a laser cutter to create wooden country shapes. To better understand nuances not easily captured by data, the students are conducting interviews with family doctors around the world about the state of and views about family medicine in their countries. Attending the Besrour Forum in Toronto allowed them to meet more international family doctors, some of whom they interviewed on the spot and some of whom they will interview later. The next step is to create a website that will describe and provide data about family medicine and health systems performance in every country and world region. The site will be a wiki so others, such as family doctors in Zimbabwe, Brazil or Poland, can add or update relevant information. After that, the research will move on to data on outputs of primary care, such as immunization rates and healthy behaviours, says Arya. The eventual goal of the larger research project is to determine if a family medicine model of primary care is beneficial to health systems, says Arya. It will be a tricky question to answer because models of family medicine differ around the world and because it’s not easy to sort causes from effects and from factors such as financial resources. Others are involved in the project too. Associate Professor Karen Grépin, who is Laurier’s Canada Research Chair in Global Health Policy and Evaluation, is helping to advise the students. Laurier Science Librarian Debbie Chaves has helped them find appropriate resources. Members of the Besrour Centre have also contributed their expertise, says Arya. As for the students, some will continue their involvement with the project next term while some move on and some new students come in. Most members of this term’s group aspire to careers in medicine, so both the research and relationship-building may help shape their future careers, says Arya. Li says her interest in family medicine has increased as a result of the project and in particular due to something she heard one of the conference delegates say.